It’s a heart-piercing tale for Schreck and other women in her family, but it also reflects an attitude toward women in this country that continues to echo. Schreck argues that that viewpoint had a deep effect on the Constitution, which dismissed the rights of women (and of minorities) from the beginning and, despite 27 amendments, doesn’t once mention the word “woman.” As we used to say in the 1960s, and as Schreck demonstrates in her pointed but non-polemical work, smoothly directed by Oliver Butler, the personal is political. An Obie, Drama Desk and Theatre World award-winning performer and writer, Schreck has also written for and acted in TV shows, including “Nurse Jackie” and “Billions.” This play was an Off-Broadway hit before moving to Broadway. The set itself evokes one of those American Legion halls, its walls heavy with dozens of photographs of older white men. Schreck recalls that her audiences were generally all men, whom she remembers as always smoking cigars. 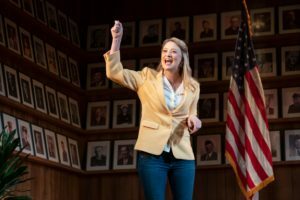 Slipping into the persona of herself at 15, part awkward teen and part self-assured orator, she delivers a reconstruction of the speech that earned her college money (her mother, who generally saved everything, threw out the original, she has already explained). An officious time-keeper, played by Mike Iveson (who later becomes much more likeable—softening the play—when he plays himself), tries to keep an enthusiastic Heidi within the contest’s bounds. It’s nice to think (though hard to tell) that some more conservative theatergoers may have unknowingly wandered into this sharply feminist show, and that maybe they will be persuaded by Schreck’s gentle approaches, even to one of her key subjects, violence toward women and the failures of government to shield women from it. Schreck seems to be naturally sunny, and she smiles a lot. She makes references later to the attacks on the Constitution today, but quietly.This is what civil discourse should sound like. Soon after explicating the Ninth, young Heidi praises the Fourteenth Amendment. This amendment and others were passed mainly to give rights to former slaves, including the right to vote—though not for all of them. Teen Heidi goes on to address concerns raised by Amendment Fourteen that have more immediate relevance today: “One other tricky thing about this clause is that it doesn’t say anything about how immigrants can become citizens. It leaves it up to the whims of lawmakers to decide who they think is a ‘good’ immigrant or a ‘bad’ immigrant.” In 1882, she points out, the Chinese Exclusion Act made immigration from China until 1943. This was news to me, and I’m glad I learned a few facts along with a new way to look at this country’s fraught history. Along with the recent play “Gloria: A Life,” about Gloria Steinem, the book Notorious RBG: The Life and Times of Ruth Bader Ginsburg” and the movies about Justice Ginsburg, “Constitution” helps to remind us of how women’s lot in this country HAS improved and how much remains to be done. Schreck’s play ends after its format transforms, and the show’s creator and star gets into a debate with an actual teenager (a rotating pair, each terrifically qualified) on the question: “Should we abolish the United States Constitution?” A coin toss determines who takes which side, and the audience is encouraged to applaud, boo, or stomp. Then one member is asked to judge the winner. I imagine keeping the Constitution wins more often than not. But it doesn’t matter. We each get a small copy of the document to take home so we can make notes on what needs to change next.